I am a big sweet bunny! I love to be petted and if you sit down on the ground, I will hop right over to be pet. I'm a friendly, happy-go-lucky guy. White bunnies with pink eyes stay at the shelter the longest - why don't you come and take me home today instead, and I promise to love you and follow you around the house and eat salads with you every day. I'm a big bunny, so would be good around gentle children or cats. 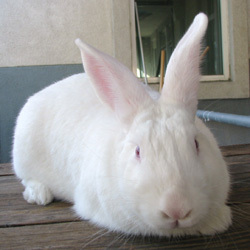 If you are interested in me as a friend for your single rabbit, I would be a great choice! Please bring your rabbit to the shelter any Saturday or Sunday between noon-4pm to have a "bunny dating" bonding session with me!